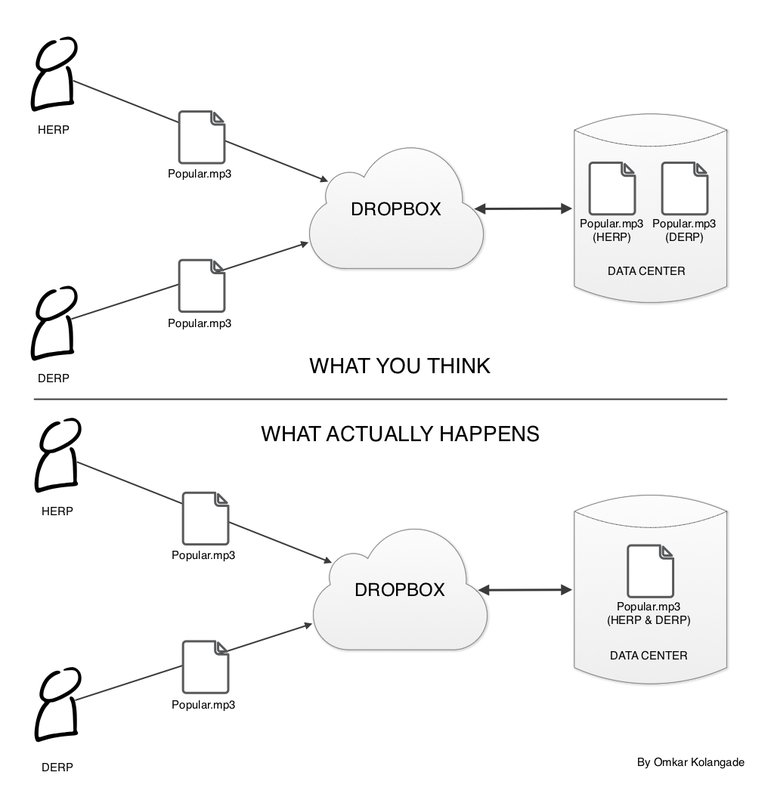 Most of us use the popular cloud storage service Dropbox. In fact, some of us love it so much that we store files directly in our Dropbox folder while working with them. One of the reasons why Dropbox and other cloud storage services have become popular is that these services give us an illusion of private space. The folder we see on our computers, phones and tablets is a nice little folder that is replicated on the data centers of these storage companies. Not quite. While these companies do have a humongous amount of data storage available at their data centers, it certainly costs them a lot to maintain such centers. They are constantly trying to figure out ways to optimize, compress and simplify file storage mechanisms to save costs and improve performance. User uploads a file to the cloud storage. The storage service realizes that some other user has already uploaded the same file. The service shrugs its shoulders (not really!) and just keeps one copy of the file instead of storing a duplicate copy for the two users. But the process doesn’t end there. The service maintains a list of users who have uploaded the same file. So when a user wants to download the file they ‘uploaded’, the service simply checks if the user is listed as one of the ‘owners’ of the file and if yes, allows them to download the file. Of course, the above process is only useful if the file is popular enough to be owned and uploaded by multiple users. Think mp3s, movie files or ebooks. So even if most of our files on Dropbox, Google Drive, Box or Skydrive are personal documents, file deduplication is certainly a useful technique to save space. But wait, what about privacy?! For that and more, check out this wonderful blog post.